A Ligurian specialty dating back at least to the Middle Ages, croxetti (also known as corzetti or curzetti) are hand-stamped pasta coins imprinted with noble insignia, as well as an equally distinctive design on their reverse sides. Although fairly obscure in the marketplace where you can nonetheless find them dried in cello bags imported from Italy, they are rarely crafted fresh in the home kitchen. This is hardly for lack of allure nor a perception that they are intimidatingly difficult to prepare, but the ever greater obscurity of tracking down the essential stamping tool* for without which croxetti would be plain, round discs of noodles. While I am not one to snub the plain, there is something fascinating about the historical intrigues of the designs, not to mention how those textures get a good grip on the sauces that are ladled over them. Since this was my inaugural attempt at homemade pasta, I didn't possess particular confidence in my ability to finesse a recipe. So much was my uncertainty that I second guessed what the results of my first batch were supposed to be, putting them aside to prepare another round of rounds, rolling them slightly thicker. While the egg-dense flavor and tooth of the later were hearty and comforting in the way that spätzle is, it was the thin, fragile, and translucent disks that were transcendent when shimmering in a slick of olive oil infused with basil and garlic, studded with bits of cured black olives and toasted pine nuts. The choice is yours, of course, but you could always flip a coin. Fresh Croxetti Pasta with Black Olive, Basil and Pine Nut Oil - My own recipe using a basic egg-to-flour ratio for the pasta. Serves 2 generously as main course. Mound the flour on a clean, smooth counter of at least 4 square feet. Indent the center of the mound with the bottom of your measuring cup to create a well. Make the well wide enough so that two eggs can share the space without topping the sides of the well. Crack eggs into well. With a fork, beat the eggs until they are fairly well smooth without yolk streaks. Incrementally draw some flour from the bottom inner edges of the well into the beaten egg. Work quickly with a light touch. Do not worry if some of the egg runs away. Simply toss a bit of flour over it and draw it back in. Once most of the wet is absorbed, begin tossing the mixture with your fingertips until it comes together in a ragged, elastic ball. Depending on size of eggs and humidity, you may need slightly more or less flour. If the dough is too sticky, draw in more flour; if it dries quickly, do not incorporate the last of the flour. When erring, it is better the dough be slightly moister than drier for easier rolling. Lightly flour your working surface, kneading dough for about 8 minutes or until it is very smooth. Wrap dough in plastic wrap and let rest for at least an hour. Do not refrigerate. Clean your work surface of bits of flour and dough before lightly flouring it again. Ensure your rolling pin is dusted with flour. Turn dough out on surface and carefully roll and press-stretch the mass away from you for a few passes. Do not be zealous; you must take your time and not over stretch. Quarter turn the rolled dough in either direction (maintaining that direction throughout) and continue to roll and turn until you are back at your beginning point. Carefully tuck your relaxed hands (palms downward) underneath dough to lift it off surface and let it gently stretch just a bit. (You can do this without tearing it if you only lift it enough so that gravity will work for you rather than against.) Lay it back on surface and resume rolling-stretching-lifting technique until the dough is approximately 1/16 inch thick. If the dough sticks to itself or the rolling pin, gently pull it off, pressing with fingertips to patch it, then lightly flour again. If you prefer thicker croxetti, roll to 1/8 inch thick. Here is a primer in traditionally hand rolling pasta. If you are using a crank roller, please consult its manual for best method. To cut and stamp your croxetti, this tutorial will provide you with most of the steps. N.B. - You must either flour each dough disk or each stamp element before every single stamping, particularly if your dough is moister. This will prevent frustrating sticking. You can either cook the pasta immediately after stamping (5 minutes in boiling water) or allow it to dry for at least 4 hours on a flat surface. Be aware that they will slightly curl or buckle as they dry. Boil pasta an extra 1-2 minutes if using dry. In a small bowl mix oil, garlic, and basil. In a small saucepan over medium heat, toss pine nuts until they are lightly toasted. Turn heat off to cool pan slightly for a few minutes. Add oil mixture (it will sizzle). Resume heat to low and gently warm. Add wine (it will also sizzle, but not spatter), then stir in red pepper flakes, salt, and pepper. Pour oil over just-drained hot pasta and serve immediately with grated Parmesan on the side. 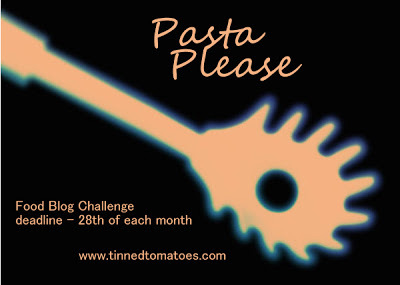 This recipe is for Simona of Briciole, hosting Pasta Please, an event founded by Jacqueline of Tinned Tomatoes. My contribution to Cinzia's Black and White Wednesday #84 hosted this week by Simona of Briciole. Simona will have her culinary gallery online tomorrow, Wednesday, May 22. Simona is accepting photographs until her clock strikes 12:00 a.m., Pacific Daylight Time. Depending where you are in the world, there may still be time to join in. For full details on how to participate and/or host future galleries, click through to Cinzia's page. Ci would love to welcome you as hostess. I think I'll drop her a line myself to sign up for another stint. I've been out of the blog loop too long, and expect to drop back in more frequently as my professional and personal demands ebb and flow. I hope you are very well, looking forward to the bounty of the summer and the conviviality of family and friends feasting at your tables.